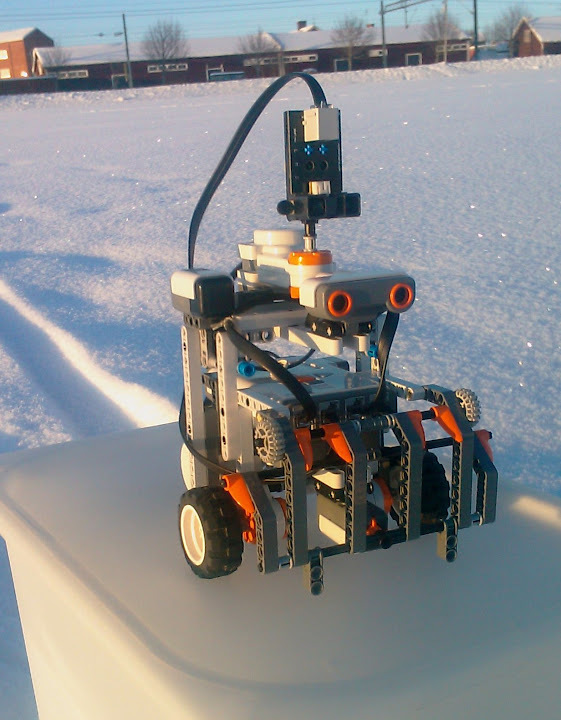 A SLAM implementation using LEGO Mindstorms NXT and leJOS. Right now we are working on the project report that we are supposed to hand in to our teachers the next week. We will probably write a short summary of it and publish it in English as well. I've recieved quite a lots of requests from people that want's to use the serverapp (PenemuNXTExplorerServer) to use with their own mapping robots. Of course is all code open source so it's free for everyone to download, change and use it for free. But I've understood that our project structure, and how to get the app to compile isn't that simple. The reason is that we use something called "linked source". It's an easy way to share the same code between two projects. We can't link the projects in this case, because we need to specify that the PC code shall compile with the leJOS pc classes and the NXT code shall compile with the leJOS client classes. I will write more about how this works soon. I will also try to make a more generic map application that shall be really simple to customize to fit for your map data. The code is already based on "modules" and "plugins" so it shouldn't be that hard to make this. More updates will be posted during the weekend. You can now download and try a preview of the PC app. First watch the screencast that presents all the features. Refreshed design: For the YouTube page (http://www.youtube.com/PenemuNXT) and this blog (http://penemunxt.blogspot.com/). New short description: "A SLAM (Simultaneous Localization and Mapping) implementation using LEGO Mindstorms NXT and leJOS (Java)." Reorganized Google Code Page: More info at http://code.google.com/p/penemunxt/. Map orientation: Rotate the map. 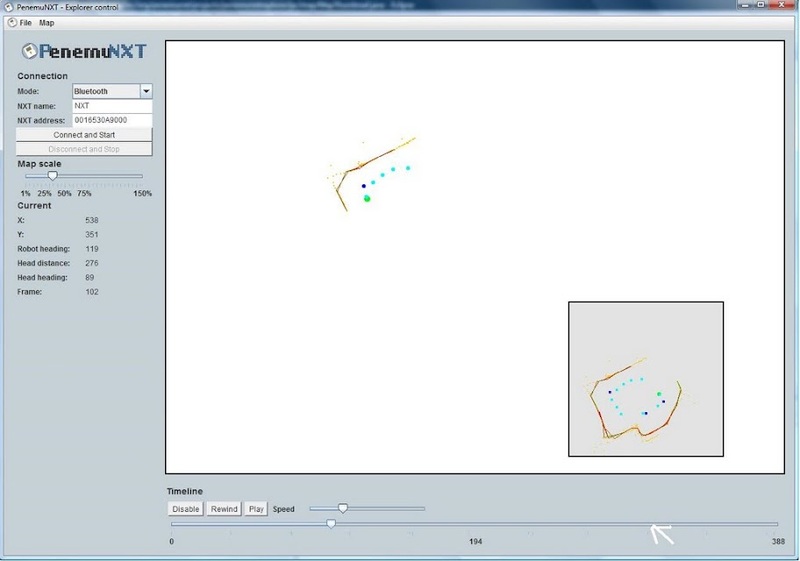 This is supposed to rotate the map automatically by using data from the Compass sensor. But we have not implemented this yet, for now you have to rotate it manually. Visualize clear area: Area where there probably are no objects are now displayed as white. Background grid: A grid with squares that represents 10x10 cm so that it is easier to calculate lengths. This is the environment that is visualized in the maps below. 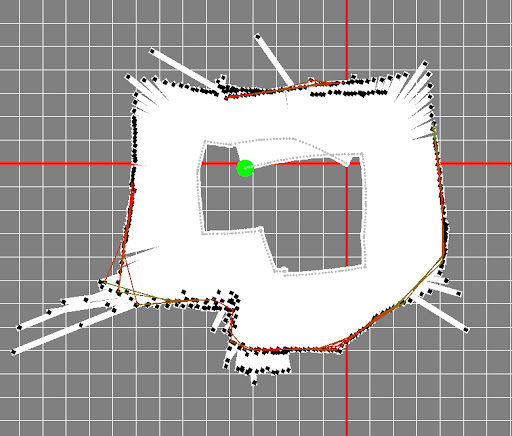 I have separated the visualization of the map to a separate control. Because of this it's really easy to reuse it in different ways. I've done this in three places for now. Preview what the map will look like if you activate the map processors that you select. If you hover the mouse over the timeline you will see a thumbnail with a preview of the map at that frame. According to me this is the coolest thing. When you are about to open a map from a file you will see a preview of it as you select one. The next thing to do is to separate the timeline as a separate control so that it is as easy to reuse as the map. The big news of today is map processors!! That's a new way we implement how the map is painted/processed. The idea is that you want to be able to add new ways to improve the map easily. What I did was to setup the interface IMapProcessor and basically it has some properties for color, name and description and a method to process the data. You can find the processors we have at the moment here. They all implement the IMapProcessor interface. There are two main types of processors, SimpleData and CalculatedData. * SimpleData is processors that basically just paint dots. For example when the robot drive. It dosn't do any improvements to it. * CalculatedData is processors that combines different data to calculate different stuff, for example where walls and objects are. You add all the processors you want to an instance of MapProcessors and call this every time you want to paint the map. This is the new admin view for them. Hopefully we will release a compiled version of the apps soon so you easily can download them and test them by yourself! We showed the robot and what it can do at our school. Here are some pictures from that day. In the third year of Swedish Gymnasium (roughly equivalent to 4th year in high school) every student has to make a project concerning at least one of the fields he/she studies. PenemuNXT is our project.